Because last year’s new recipe a week goal was so much fun and so doable, I’m going to do it again! I thought about doubling it, but then I rememebered that this is suppose to be fun, not necessarily a contest. I’m not the cooking stalwart that say, Julie is, but hey, it’s fun, right? So, this week I actualy cooked two lovely new meals. One from Martha’s that was featured in her January issue. I love those four course pull outs that she loves. It makes me want to start subscribing to her all over again! 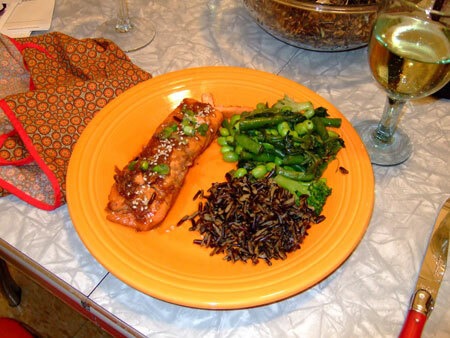 And I also made this: bourbon salmon. Doesn’t it look healthy with its charming side dishes of edamame mixed vegetables from Trader Joe’s and some nice wild rice? Desperately easy and oh so good! Perfect for weeknight dinners! With a nice glass of wine and a nifty home-made napkin that I finished off with red bias tape (a leftover from my Thanksgiving craftiness that still keeps giving), it makes for a nice-ish picture! It say “nice-ish” because there are so many lovely photos of food photography, like this one for CHOW.com’s salted hazelnut brittle. Isn’t that picture gorgeous? It takes quite a brilliant photographer to turn brittle into something as gorgeous as a stained glass window. Or some of the yummy things on my favorite blogs like Alicia’s snugglesome blog or the quiet beauty of 3191. I really want to be a better photographer to do justice to the subjects and for my blog. Hmmm… Perhaps another goal for 2008. Anyway, have a nice weekend, everyone!